Being fat is blasphemous. It is a powerful and burdensome sin. And when Gabourey Sidibe was fat shamed by critics this week in response to her appearance at the Golden Globes, it became all the more clear that the punishment for this sin — be it in the form of derision, public shaming, or an endless stream of weight-loss commercials — is swift and unrelenting. Encouragement is rare, and instead of fostering a cultural revolution that values self esteem instead of thinness, women of size are encouraged to eat less, exercise more, and sideline our passions and goals until the Body Mass Index deems our weight normal. Gabourey Sidibe, an actress currently starring in American Horror Story: Coven , reverses the singular “fat folks are destined for unhappiness” narrative with her unwavering confidence and unwillingness to conform. 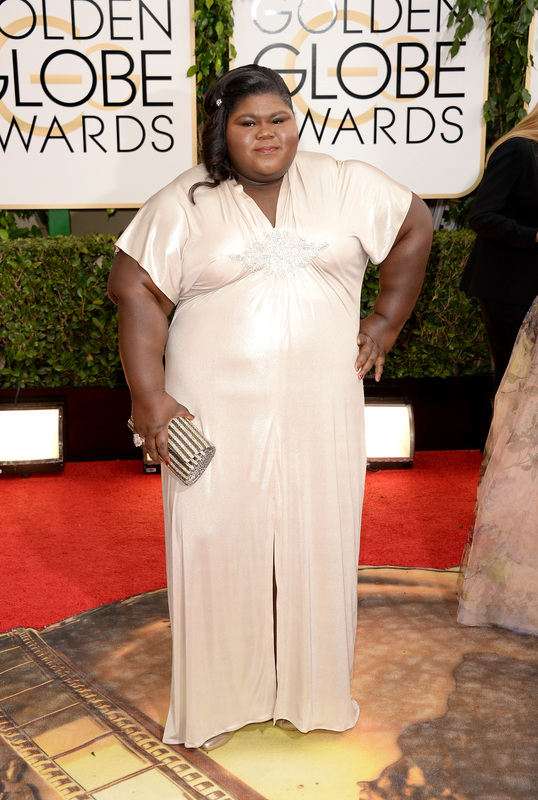 Gabourey Sidibe flaunted her confidence and beauty last night when she strutted on the Golden Globes red carpet in a shimmery, gold gown. A silver broach gathered the dress at Sidibe’s chest and created an elegant cascade down to her stiletto-clad feet. A gold-and-silver clutch and dazzling ring accented the gown. Her continuous smile told a public tale of a black woman living it up on the red carpet, but critics snarked about an ill-fitting gown, attempting to embarrass a woman of color and size at the Golden Globes. They projected their issues onto Sidibe, chiding the star for daring to be gorgeous, radiant, and comfortable in her fatness. I’d imagine Sidibe is accustomed to personal attacks. She’s been fielding questions about her chocolate complexion and wide waist since she garnered an Academy Award nomination for her first role as Precious Jones in Precious. The world conflated Sidibe with the illiterate, HIV-riddled character she portrayed in the movie, leading some to question her acting chops and her confidence. Fellow actress Joan Cusack even told Sidibe she should quit the film business because it's so "image conscious." Her focus on her craft, happiness and individuality is a triumph for women of size. Happiness spread through me as soon as Sidibe’s tweet filtered through my Twitter timeline. In choosing to address the criticism, Sidibe told the world that she’s heard their insults about her weight, her complexion, and her attire, and she’s tired of being polite. The actress also used her platform to rebut the cultural narrative that women of size are supposed to chase thinness instead of our passions. Demetria Lucas, writer and star of Blood, Sweat, Heels sums up the illegibility of Sidibe to a weight-obsessed world when she writes: "There’s this reigning idea that fat somehow equals lazy or incompetent or self-loathing. Being fat is supposed to block blessings and keep folks from achieving their dreams. And Sidibe’s sizable body just doesn’t jibe with what winning is "supposed to" look like." Women of size are told our bodies are a result of gross negligence. We’ve used sweets and butters to destroy our bodies, so our obligation should be to chiseling the fat away. Dreams and companionship be damned. We are defined and expected to be imprisoned by our bodies. Sidibe offers women of size another option. Though the public’s gaze is focused on her weight, she chooses to laser in on other pertinent aspects of her life, like her booming career and red carpet invites. Media images dictate that women of size have no place in a culture that values thin bodies. Sidibe bucks the trend, and tells other women to pursue happiness in whatever body they’re in. It is damning to halt life until we reach a goal weight. None of us, including Sidibe, should be relegated to that fate.